If Everybody Loves Dogs And Nobody Loves Cancer, Why Is This So Difficult? 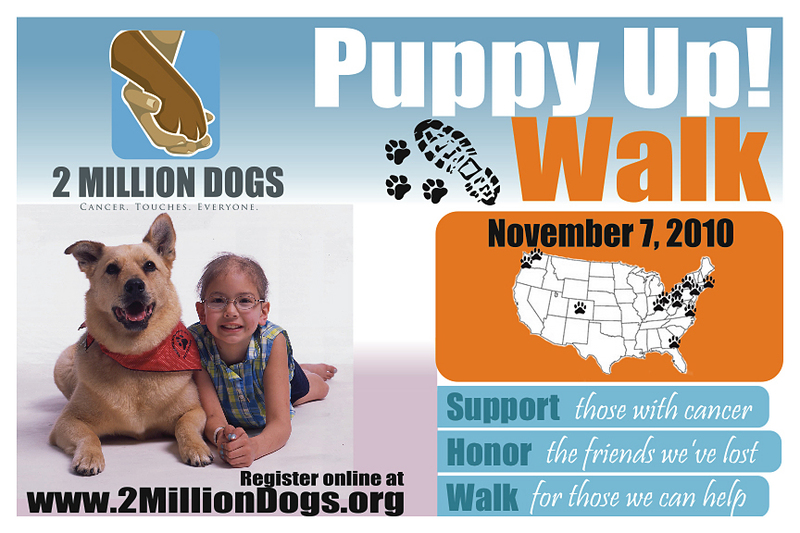 Even though everyone agrees that this is a wonderful cause and have expressed interest in joining the walk on November 7th, I’ve not been too lucky finding volunteers to help me organize the event. I realized that if this walk was going to happen in Seattle, it was going to be up to me to put in the hours sending emails, making phone calls and hitting the bricks. It’s hard work, but considering that this organization sprang from Luke Robinson’s 2300 mile, two year walk from Austin to Boston, this is a piece of cake. Quite frankly, distributing the posters these past two days forced to take a much-needed break from my “home office”. While I was happy to get away from the computer, I really had no idea what an undertaking this task was going to be in a city the size of Seattle. To begin, I had to find every pet-related business in the area, this included: pet supply shops, pet groomers, veterinarians and veterinary hospitals, dog groomers, dog walkers, dog trainers, doggie day care, dog kennels, dog parks and dog-friendly restaurants and bars. List in hand, it was time to plot the best way to efficiently drive from one part of town to the next, figuring in all of the road closures, one-way streets, rush hour traffic and the rest. With three weeks to go and plenty of posters and postcards left to distribute, I will have the help of a couple of people this coming week. 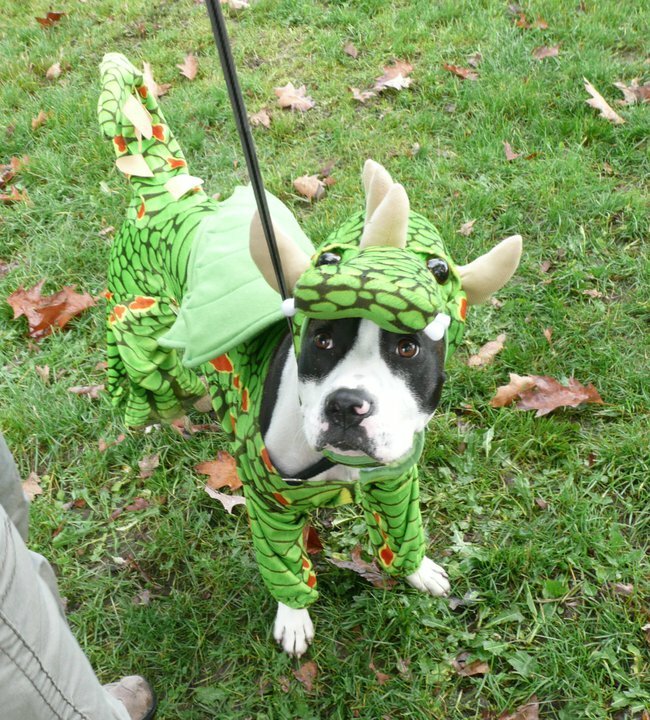 November 7th is looming, and there’s still a lot that I need to focus on, not to mention figuring out what costume Riley should wear for Dog-O-Ween this year. Hmmm, maybe he wouldn’t mind wearing a 2 Million Dogs Puppy Up! Walk sandwich board? *From now through November 7th, Tiny Growl will donate $3 from every ScooPup Pocket sold to 2 Million Dogs. Ok, it’s time to do a little math. I know you were told there would be no math, but sometimes we have to endure a little pop quiz, or in this case, a poop quiz. So, here we go. If you’re like most people, you walk your dog at least once a day and at least once a day you need to pick up dog poop. How many times a week do you walk your dog? And how many miles do you think you might cover? On a monthly basis, how much poop scooping do you think you’ve done? How far have you traveled in a month? In a year? Ok, I don’t really need an answer, but we all know that lots of us are covering lots of miles and that means there is a lot of poop scooping going on across the country. Now imagine how much poop scooping you would be doing, if you and your dogs were on a 2,000 walk. Luke Robinson is doing just that with his two Great Pyrenees, 4-year-old Hudson and 9-year-old Murphy. Starting out in March 2008, from their home town of Austin, Texas, these three are heading for Boston, Massachusetts, 2,000 miles away. “I sold my truck, put my stuff into storage and Hudson and Murphy and I got on the road,” Robinson said. In the past two years, they have walked through 14 states. 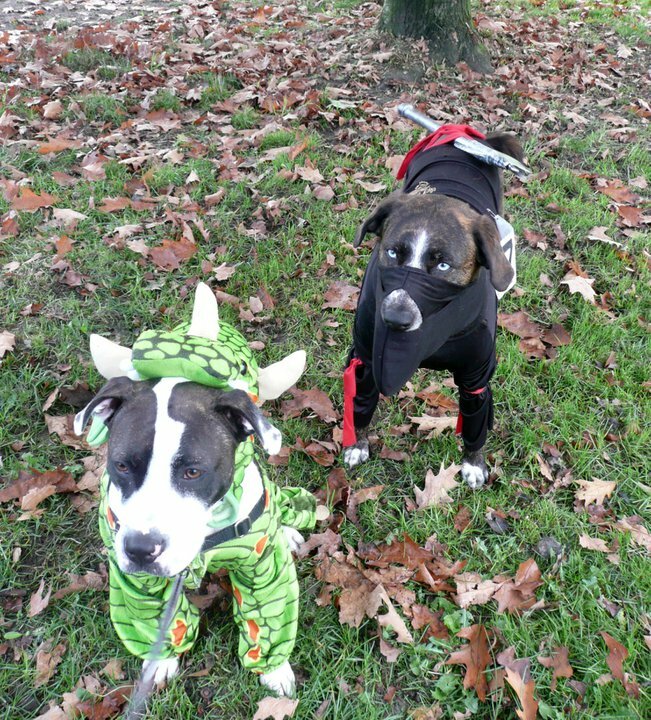 Their mission is to raise awareness and help combat canine cancer. Robinson lost his beloved dog Malcolm to metastatic bone cancer, so he and Hudson and Murphy started 2 dogs, 2000 miles. He still carries Malcolm’s ashes in his cremation jewelry. 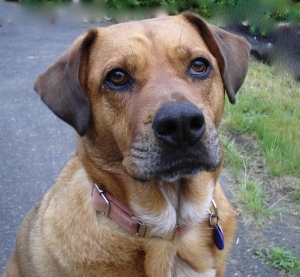 Biologically, the tumor cells in dogs is pretty much the same as cancer cells in humans,” Robinson said. It’s called Comparative Oncology, a relatively new field that he wants more funding for. Robinson says cancer research on dogs would help people as well. Robinson created “Puppy Up”, where he sells merchandise to help fund his journey. He also wears a memorial shirt and for $25 you can add the name of your deceased pet. Sponsors help pay for the dog food and veterinary care. Water is his main need, but he has drop-off points along the way where he gets supplies and volunteers who help him. And how are the dogs doing? “They’re so happy, so excited every single day. They’re fired up when we wake up in the morning.” Robinson says. 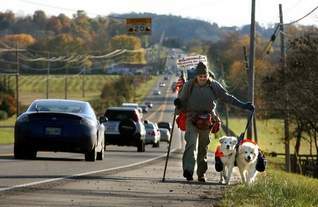 They walk about 8 miles a day and at the end of their journey, he will begin fundraising for 2 Million Dogs, a non-profit he conceived of during their walk with the simple idea of getting two million dogs to walk two miles to eradicate cancer in pets and people. 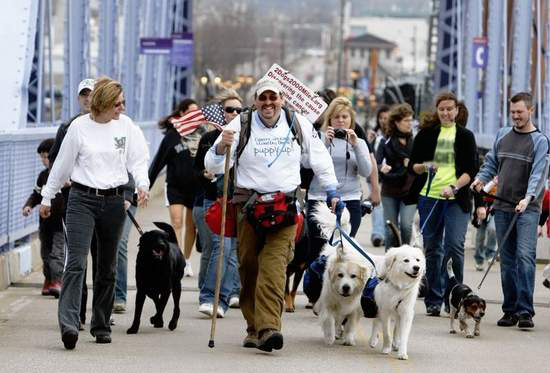 “If two dogs can walk two thousand miles for cancer, surely we can get two-million dogs for cancer,” Robinson said. So, how much poop got scooped along the way? Let’s try not to think about it. But let’s not forget to support Luke, Hudson and Murphy by pledging to become part of 2 Million Dogs when they roll out their cross-country campaign this year. The ten-legged trio plan to end their journey when they arrive in Boston on June 19th.